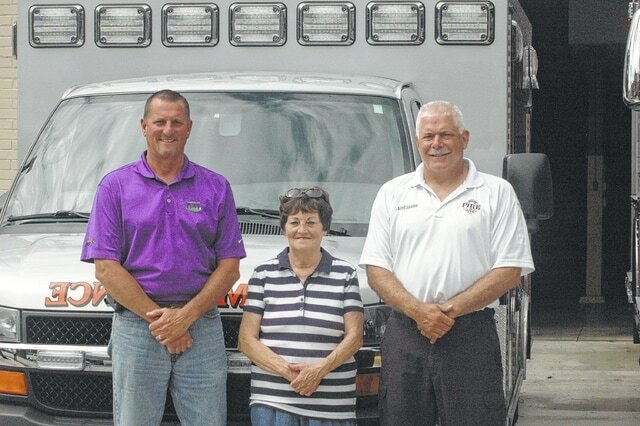 Jeff Shafer (right), current chief of the WAFD, was sworn in as Interim Chief of the West Alexandria EMS on Tuesday, June 16, by village Mayor Carol Lunsford (middle), and Village Administrator Chris Day (left) at the West Alex Fire Department. Shafer will be the interim chief of EMS until the consolidation of the two departments becomes official, sometime before the beginning of the 2016, when he will become the Chief of both departments. WEST ALEXANDRIA — West Alexandria Fire Chief Jeff Shafer was sworn in as Interim Chief of the West Alexandria EMS on Tuesday, June 16, at the West Alexandria Fire Department. Shafer took an oath read by West Alexandria Mayor Carol Lunsford to become the new Interim Chief of West Alexandria EMS in wake of the retirement of EMS Chief Rhonda Martin. It also sets the stage for the consolidation of the Fire Department and EMS within West Alexandria, to create a single department. Shafer will be interim chief until the consolidation of the two departments becomes official, when he will become acting chief of both EMS and Fire. According to West Alexandria Village Administrator Chris Day, the consolidation will happen by the first of the year but he hopes it can happen sooner than that. Day said it is important the consolidation process isn’t rushed to help ensure long term success of the department. Shafer continued, saying the consolidation of the two departments makes sense in the long run and should allow for better service to the community. “We have quite a few members cross trained right now, so with that being said we’ll have the ability to get the apparatus and or medics out quickly so that should cut our response time down and those kind of things,” he said. Shafer believes his 35 years of experience in the fire department, and the help he has already received from current members, will help make the transition smoother process. Shafer thanked Martin for her years of service, dedication and hard work for the Village of West Alexandria.